2G Engineering has designed and manufactured the charging station stands in attached pictures for Argonne National Labs to be placed at their Electric Vehicle Interoperability Center. In addition, an EUMD (End Use Measurement Device) will be placed on this charging stations to monitor power and branch loads to the EVSEs. 2G Engineering also developed and designed the EUMD that will be utilized by the Argonne National Labs (ANL) charging stations. In FY 2011, a 3.8-kilowatt photovoltaic (PV) charging station for electric vehicles was installed near building 212. Five years later, four additional charging stations were added to the previous stations in spring of 2016. The additional stations are based on Argonne National Labs (ANL) research activities on standards development, compact metrology, and interoperability of EV-Grid related charging systems. The purpose-built steel pedestals that hold the electric vehicle supply equipment (EVSE) were designed at ANL, incorporating features that combine multiple EV charging installation items into a single turn-key product that reduces the largest portion of EV charging equipment installation cost – labor. The 4" square, ¼" wall steel tubing provides bollard, pedestal, cord handling, input conductor routing, and sign post in a single assembly. The ANL designed submeter communicates with the EVSEs to monitor status of the vehicles being charged, along with power, energy, and time of use, which is reported to a central database. This information can be used for both research/field studies, as well as for the ANL (future) Workplace Charging reservation system allowing users to reserve and confirm their charging spot as well as monitor charging progress. This equipment will be used for future research on topics that include dynamic load management that balances available solar/stationary battery storage energy resources to vehicles charging at any given period. Other research includes field studies on standards development of open charging communication protocols, submetering standards and procedures for implementation of NIST Handbook 44 (Commercial dispensing of electricity as a fuel). These charging stations join the others across the ANL campus, bringing the total to 30 charging points. These stations, along with others at nine areas across the ANL campus, are part of the workplace charging program that leverages charging stations to allow non-government vehicles to charge at work, while the stations are unused during the day. The workplace charging program enrolls employees in a registered vehicle process including a monthly fee for use of the charging station. The powered dual axis tracker increases the energy yield by keeping the array pointed at the sun for maximum energy harvesting the whole day. It can produce enough power to charge four electric vehicles at the same time! The system is also grid-tied: when the system is generating surplus power, the electricity can be returned to the building for use. Inversely, building power can charge vehicles on days when the solar resource is low. 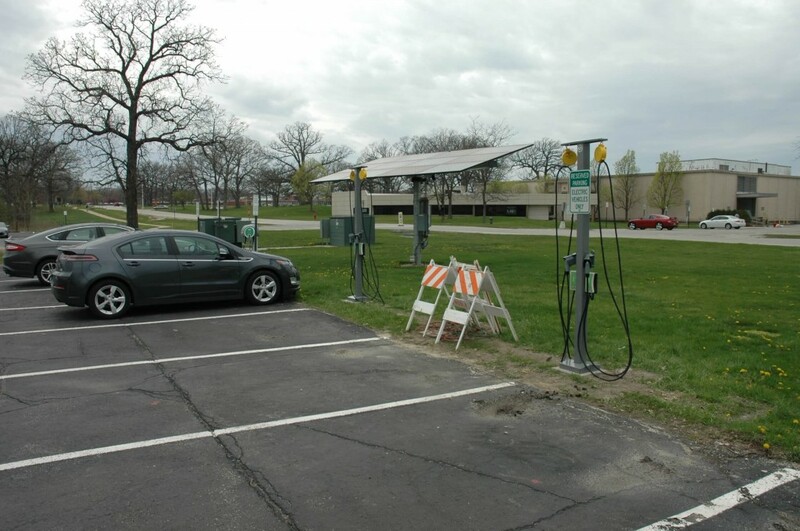 This PV charging station contributes to Argonne renewable energy generation goals laid out in Site Sustainability Plan. One benefit to the Lab is that direct zero carbon electricity from the solar array delivered to the ANL fleet of electric vehicles displaces petroleum consumption and reduces the carbon footprint. The annual solar array harvested energy can supply energy to drive about 100 miles per day, or about 37,000 miles of Neighborhood Electric Vehicle (E-ride NEV) driving per year. Since this is local generation of electricity, there aren’t distribution side losses. The web-connected photovoltaic inverter keeps track of the daily and annual actual energy collected by any particular array. Solar Pathfinder site assessment tool and modeling software estimates electricity generation of 6,163 kilowatt-hours per year, valued at over $300. Twelve solar panels, coated with anti-reflective glass to improve power delivery, approach 20% conversion efficiency. Direct current is converted to alternate current using inverter with weighted efficiency of about 95%. Dual axis tracking system uses electricity generated by the panels.